of compressed globular form, the frog’s head with round bulging eyes emerging opposite a short tail, and with four short legs applied on the sides, the wide mouth with ‘ropetwist’ rim encircled with four stepped knobs dotted with iron-brown splashes, the sides decorated all over with stamped florets, covered inside and out with a pale olive-green glaze, the flat rimless base left unglazed, the exposed gray stoneware body burnt reddish-brown in the firing. A frog-form celadon waterpot of slightly smaller size in the Shanghai Museum, similarly decorated with stamped designs and stepped knobs but lacking the iron-brown splashes, was illustrated by d’Argencé in Treasures from the Shanghai Museum 6,000 Years of Chinese Art, San Francisco, 1983, no. 56, with description on p. 157 where the author calls it “…one of the most exquisite works of its kind.” Another, less elaborate frog-form celadon waterpot with stamped decoration, in the Zhejiang Provincial Museum, recently exhibited in Geneva at the Musée des Collections Baur and in Paris at the Musée Cernuschi, is illustrated in the catalogue entitled Céladon: Gres des musées de la province du Zhejiang, Chine, Paris, 2005, no. 14, p. 76. A plain celadon frog-form waterpot of closely related form, raised on a high flaring foot like the example cited above, discovered with a group of green-glazed wares and some bricks moulded before firing with inscriptions dated A.D. 292 and 293 at Liulang gongshe in Jiangningxian, Jiangsu province, is illustrated in Wenwu, 1975, No. 2, p. 94, fig. 4. Other examples of this wide-mouth type of frog-form celadon waterpot from the Collection of Sir Herbert Ingram, less elaborately decorated and raised on a flaring foot, are illustrated by Tregear, Catalogue of Chinese Greenware in the Ashmolean Museum, Oxford, 1976, nos. 60, 62, 63 and 64, with descriptions on p. 33. Compare also the frog-form celadon waterpot of closely related form, resting on a flat base similar to the present example, but with a short neck rising to a small mouth in the center of the back, in the Art Institute of Chicago, from the Tyson bequest, illustrated by Mino and Tsiang in Ice and Green Clouds: Traditions of Chinese Celadon, Indianapolis, 1986, no. 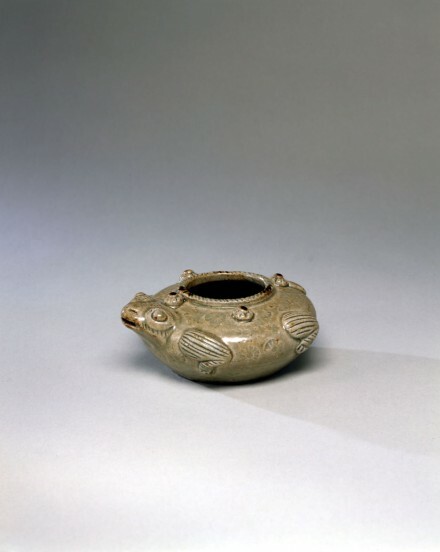 22, p. 70, where the authors point out that this type of jarlet was intended to serve as a receptacle for water to be used for wetting the inkstone and also illustrate the earliest recorded example of this type, found in a tomb at Yueshigang near Nanjing dated to A.D. 273.